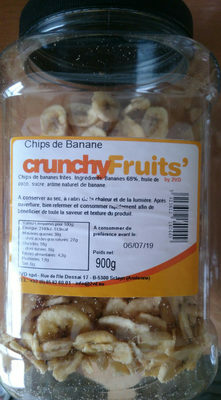 Chips de bananes frites. Ingrédients Bananes 68%, huile de coco, sucre, aróme naturel de banane. Product added on February 6, 2019 at 1:37:44 PM CET by hellosct1. Last edit of product page on February 6, 2019 at 1:41:07 PM CET by hellosct1.